Wiltshire dairy farmer Kate Gallop has raised thousands of pounds in aid of Macmillan Cancer support by opening her farmhouse garden to the public. Aly Balsom takes a closer look at her labour of love. It’s taken Kate Gallop 28 years to persuade dairy farming husband Chris to include the field in front of the farmhouse as part of the garden. This year, her persistence paid off and her dream of fashioning a piece of country manor parkland at the entrance to the farm as ‘a lasting legacy’ has been realised. Lime trees now line the edge of the 1.2 hectare (three-acre) field next to the driveway, while three oaks at the top of the grassland form the perfect spot for a bench to soak up a summer evening. Kate hasn’t been able to keep livestock out of the area completely, which makes the wooden tree guards a useful addition. The field also proved a useful parking spot for about 450 visitors that attended one of Kate’s now famed National Garden Scheme (NGS) open garden days in aid of Macmillan Cancer Support (see box). Now in its third year, the event takes place on the third weekend of June, with people traveling from miles around to take in the farmhouse garden, visit the stalls, have a slice of cake and take the circular walk around six other gardens in the village. Created by Chris, Two large, rusted metal spheres in one corner of the parkland area proved a talking point on the day. The metal balls are just one of several sculptures scattered around the garden, which have been made by Chris to meet Kate’s vision. “It just needed something big and bold and easy to make,” says Kate, in reference to the spheres. Chris is keen to use whatever he can on-farm to create something original for the garden and the large bluebell sculpture in the natural woodland walk area is one such example. Ribbed pipe has been used to make the stem, with the pipe split in two to create the leaves. The flower head has been made with a ‘sanitary trapper’ from the old herringbone milking parlour. Bits of metal milk liner then hang in the upturned trapper to create a wind chime. “If you get a strong wind, you get a tinkle. But when it blows that hard, you probably don’t want to be out here,” admits Chris. Elsewhere in the garden there are wooden benches carved by Chris, a circle of posts arranged at varying heights to create a snail and various nods to the farm, such as planters made from metal water troughs in the contemporary area and metal cart wheels. Kate also admits to having a bit of an obsession with staddle stones, which she snaps up at auctions and farm sales and uses to edge the driveway. The drive’s verge is also lined by an avenue of limes. When the woodland parkland fencing went up a couple of years ago to replace an untidy wire fence, Kate took the opportunity to make the verge wider into the dry cow paddock. The dry cows and a couple of calves proved a particularly popular photo opportunity and talking point on the garden open day. Various aspects of the garden have a personal story linked to the family. The oak tree at the start of the gravel drive approaching the farmhouse was brought with Kate and Chris when they moved from Chris’s family dairy farm in Wotton-under-Edge to set up their own dairy at Oakwood Farm 28 years ago. Two dens in the woodland area are also lasting memories of a Bear Grylls-type party the family had about 10 years ago for 16-year-old son Andrew’s sixth birthday and a fire pit, made by eldest son Stuart, now 21, is now used for family fry-ups, rather than barbecues. Many of the features in the garden have been a family team effort and even the stone bridge over the currently dry pond was constructed by Chris and the boys eight years ago. The pond is packed with bull rushes which originated from a pond elsewhere on-farm, while the irises have multiplied from a couple of plants given to the family in an old fertiliser bag by a friend. The garden is enjoyed all year round and no doubt a draw for Kate’s bed and breakfast guests who can stay in one of three rooms in the house and have access to their own sitting room. 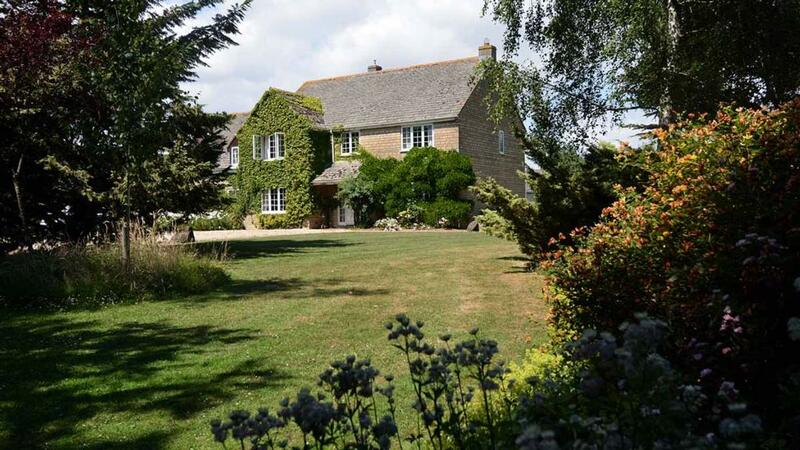 The bed and breakfast is marketed as a traditional, farmhouse stay, with the farm’s location near Cirencester and the Cotswolds, proving popular with business people during the week and wedding and holiday guests at the weekend. Guests are surprised it’s a working dairy farm while also being so quiet. And they like the little places in the garden they can go and sit and chill out. Over the last three years, hundreds of visitors have descended on Oakwood Farm to wander round the farmhouse garden and do their bit to raise money for Macmillan Support on the third weekend of June. Kate Gallop’s summer house forms ‘Tea-HQ’ on the day, serving numerous cups of tea and coffee and slices of home-baked cakes headed up by Jenny Jarvis, the chair of the Macmillan Cirencester Committee, and her team of 20 volunteers. Kate’s initial support for Macmillan started about nine years ago when she instigated a World’s Biggest Coffee Morning event in aid of the charity at her son’s school Rendcomb College. After two years, the event proved so popular it had to move to a larger venue in Cirencester. After seeing Kate’s garden, Catherine North, Macmillan fundraising manager for Gloucestershire, suggested they expand the event further and take it to the farm. It made sense to get involved with the National Garden Scheme (NGS) as they would help promote the event. Kate also did her own advertising, while Macmillan did some social media. By linking with NGS, the of £5 a person gate money goes to NGS who distribute it to nursing charities. Any other funds head to a garden’s charity of choice, Macmillan in this case. Following the success of the first year’s event, the day quickly expanded to include Upper Minety village. This year, six villagers opened their gardens, with Oakwood Farm forming the hub for parking, teas and stalls. Visitors then picked up a map to follow a circular village walk, taking in the gardens and also the church, where there were flower arrangements, a harpist and ‘tray gardens’ produced by children from Minety Primary School. The village also ran their ‘Scrapheap Challenge’, where villagers make various statues out of scrap in aid of the village hall. Kate’s garden also had about seven stalls, with vendors paying a pitch fee which went to the charity. This included two garden nurseries and a pizza oven. The Minety Hand Bell Ringers also played in a marquee. This year, the event raised £1,605 for Macmillan, with the open gardens event raising £4,249 for the charity over the three years. All in all, Kate’s efforts have raised nearly £14,000 for Macmillan since 2012. Catherine says Kate’s charity work is hugely appreciated by Macmillan. Next year’s event takes place on June 23, from 11am-5pm. For more information, call Kate on tel: 07876 316 529. The NGS help about 3,700 garden owners a year open their gardens to the public, with money raised for charity through entry fees, tea and cake. Beneficiaries of the NGS include The Queen’s Nursing Institute, Marie Curie, Macmillan Cancer Support and Parkinson’s UK.